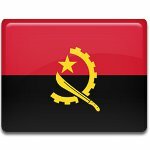 Every year the Angolans celebrated Peace Day on April 4. This holiday celebrates the end of the Angolan Civil War, that continued for almost 30 years. The Angolan Civil War began in 1975 immediately after Angola gained independence from Portugal. The country had already been weakened by the Angolan War of Independence, that lasted from 1961 to 1974. And the civil war that outbroke, became the fight between two former liberation movements MPLA (People's Movement for the Liberation of Angola) and UNITA (National Union for the Total Independence of Angola), that wanted to come to power. The civil war lasted for almost 27 year with some short interludes. During the war over 500,000 people died and over 1 million were internally displaced. The military actions totally devastated infrastructure of Angola and severely damaged public administration, economic enterprises and religious institutions. The war ended when General Paulo Lukamba became UNITA's leader. The military commanders agreed to a ceasefire and signed a Memorandum of Understanding on April 4.